Mrs Banks is from the famous Disney musical: Mary Poppins. She hires the flying nanny due to her inability to look after children as she is off fighting for the vote for women with the suffragette movement. Disney puts a lot of effort into detail and attempting to be partially educational. 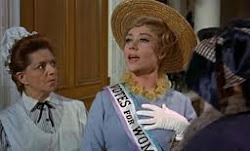 Mrs. Banks gives us a nice reference to Mrs Pankhurst being "clapped in irons again". 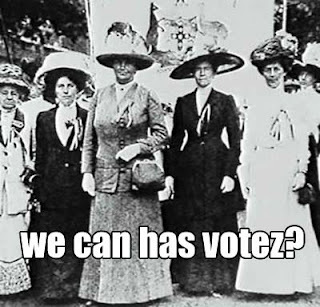 Emmaline Pankhurst was the founder of the Women's Social and Political Union, along with a couple of her own daughters. It appears they were a formidable mob not shying away from violence and militant tactics in their fight to secure votes for women in the UK in the early 1900s. Is that an Australian crest on the banner? Thoughts? Although in Disney's version Mrs. Banks is not dragged off to the slammer and has the most amazing tailoring.